Two films profile women who surf for the love of the sport. Watch as they express their devotion to surfing in their daily lives. Directed by Luca Merli. Italy. 2016. 8 min. In the strange and beautiful treeless landscape of Fuerteventura in the Canary Islands, Leah Dawson creates music, hand shapes her second board and dances on water with power and grace. Grounded by earth and charged with energy by water, Leah Dawson is a solar creature influenced by the moon’s gravitational pull, like the sea. Directed by Paul Ferraris & Elizabeth Pepin Silva. Mexico. 2015. 30 min. La Maestra (The Teacher) profiles Mayra Agulair, a teacher in a tiny rural fishing village in Baja, Mexico, who becomes the first Mexican woman surfer in her area. Told in Spanish using mainly Mayra’s voice, the film shows how she has gone on to inspire her students and other local women to take up the sport and follow their dreams. Through her deep connection to the ocean, Mayra has also become an environmentalist, teaching her students the importance of land and sea stewardship through hands on learning. Directed by Heather Hudson. USA. 2016. 43 min. The Women and the Waves 2 celebrates women and their approach to surfing and life. The film looks at the state of surfing today from a feminine perspective and features positive role models who give back to people and the planet. Ultimately, the film says that a life filled with gratitude for one another and the world we live in, is a life well lived. And when surfing is added to the equation, it makes life that much more sweet. 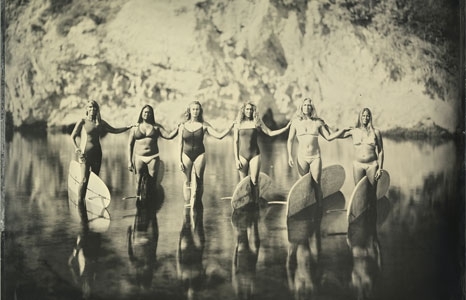 Following in the footsteps of the groundbreaking 2009 film The Women and the Waves; The Women and the Waves 2 continues to explore the culture of surfing in relation to six surfers and their lives both in and out of the water. July 9 at 4pm: Director Heather Hudson (The Women and the Waves 2) and one of the local surfers in her film, Mary Bagalso will be in attendance for a post-screening Q&A. Currently, Heather is a film producer living in Santa Barbara, California. The one constant in Heather’s life is her absolute love for surfing and the ocean. She begins most of her days with a surf session at a world-class surf break in south Santa Barbara County, where she is known for her graceful longboard style. After receiving a bachelor’s degree in sociology from UCLA in 1984, Heather worked in advertising until she became a full-time mother in 1991. In 2007, she started her film production company, Graciegirl LLC, and created the groundbreaking 2009 documentary surf film The Women and the Waves with friend and mentor Peck Euwer of Swell Pictures Inc.
For more than 18 years, Heather has supported and volunteered for Heal the Ocean, a successful Santa Barbara-based non-profit citizens' action group committed to ending ocean pollution. In 2012, she was named to the Heal the Ocean Board of Directors where she heads up fundraising and events. No matter how busy her life becomes, Heather manages to find time to get in the ocean. It is her love of the ocean and passion for surfing that motivates her to make films that show a slice of life that is relevant to the female experience in our society. Mary Bagalso moved from Southern California to Hawai‘i eight years ago. She grew up an hour away from Huntington Beach where she frequently went to bodysurf and bodyboard. She first tried surfing when she and her brother took a trip to Hawai‘i and caught her first wave at Canoes in Waikiki on a tiger striped Ben Aipa pink and yellow board. That wave changed her life and ignited a long lasting relationship with traveling, exchange of friendships, stories, and Mother Ocean. She is delighted to be a part of The Women and the Waves 2.